The theme for last night’s Blandy Photo Club meeting was “Tabletop Photography,” so I returned to my files and re-edited a few images from the Blueridge Photography Workshop I attended last winter. Although I really enjoyed experimenting with indoor macro photography last year, I haven’t spent time in that genre for many months. I have to admit that after playing with these files, I’m re-energized and ready to get out the equipment again! I shared five images of this rose (edited in different ways) with the club members, and this one was one of the favorites. This photo was first edited in Lightroom, where I cropped slightly and eliminated a few dust spots. Then, I took that file into Color Efex Pro, where I used Glamour Glow and Fuji Velvia Film filters. I returned to Lightroom to then tweak the vibrance and sharpening slightly. I’ve enjoyed spending more time on continuing education this winter, and I’m seeing the results as I return to my photo files with a fresh outlook and improved skills. I’m able to give some images I’d passed over in the past a better chance at seeing the light of day. Now, I just need to get some of these deadlines finished so I can keep on learning! Delicate shapes and delicate color. Beautiful! Thanks, David! I have a greater appreciation for roses, for sure, after working with them in macro. 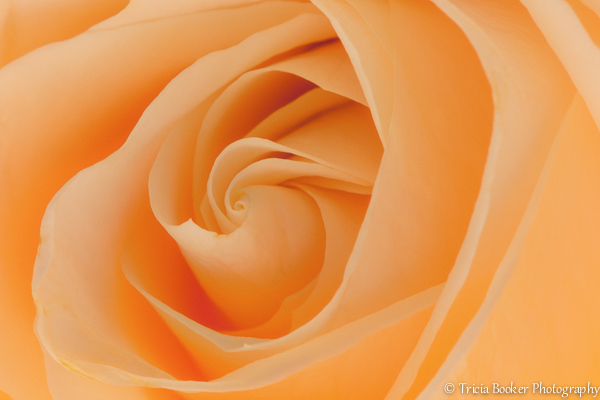 Pingback: A Rose Reworked | Tricia Booker Photography | Pamper your Feet®….and theirs…. A simple flower head that conjures eloquence and wonder. Yes, Sally, so true. Sometimes it’s good to stop and take another look at the simple things around you that you take for granted. The glamour glow filter really brought out that softness. I will use it again with flowers, I think! Wow Tricia that rose has the most beautiful ethereal glow, it just swirls me into its heart.